Could these be cases for the iPad 5? There's little doubt Apple will unveil an iPad 5 this year, and judging from leaked third-party cases, it could be a dramatic overhaul for the market-leading tablet. BGR reported Monday that images claiming to be third-party cases for a fifth-generation iPad have surfaced on Alibaba, a Chinese global trade website. 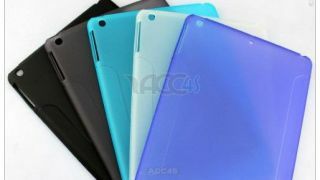 Made from thermoplastic polyurethane (TPU) material and available in six colors, the cases supplied by Shenzhen Sinofly Electronic Company Limited point to a possible new look for this year's iPad. The key difference would be a form factor more in line with the iPad mini, complete with ready-made holes for placement of the larger tablet. Without an official announcement from Apple, it's impossible to say for certain what an iPad 5 might actually look like, despite recent leaks to the contrary. Third-party case manufacturers have a mixed history where Apple cases are concerned, with many Chinese suppliers taking an educated guess as to what's coming next based on images leaked to the media. After shots of a rumored iPad 5 which closely followed the design of an iPad mini surfaced last month, it's entirely possible these cases have been created using the same information. With the spec-bumped iPad 4 released only four months ago, many Apple pundits expect the iPad 5 to debut this fall, presumably alongside a refreshed iPad mini.